Just felt like posting a shot from my first Spring Training trip, three years ago to Florida. I went specifically to see Dodgertown before the Dodgers left their longtime spring home for Arizona. I understand their need to move their spring base out west, closer to their Los Angeles home, but it’s still sad to look through the photos and know that it’s not like that anymore. It was a great day, a great way to spend a morning and afternoon as a baseball fan. I went to see the Mets play the Dodgers @ Dodgertown in 2006. I enjoyed it more than when I saw the Mets play @ Tradition Field. 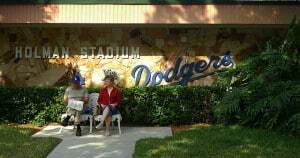 The history of Dodgertown (i.e. where else could you go now and say that Jackie Robinson used to play here against Willie Mays (1951) or Joe DiMaggio (1950)) is fantastic, and you actually felt like you were watching baseball in the 1950s.